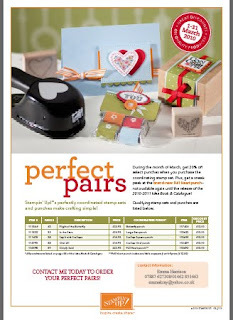 I am so giddy with excitement, just when you think you can't beat the Stampin' Up Sale-A-Bration, they go and launch another fantastic offer! During the month of March you can choose your perfect pair and select a punch and the coordinating stamp set, and receive 20% off the punch! And if that wasn't exciting enough, for a limited time you will be able to order the Full Heart Punch that is not currently available in the main catalogue. This punch has been out in the States for some time now but this is the first time that we've been able to buy it in the UK! It's a gorgeous punch and coordinates perfectly with the Simply Said stamp set. This punch will only be available whilst stock lasts and then once stock sells out you'll have to wait until the release of the new catalogue in September to get your hands on it, and who wants to wait that long?! So, if like me, you can't wait to own the Full Heart punch then get in touch and I can place an order for you. The punch is available on its own for £12.50 or at £10.00 if you buy the matching Simply Said stamp set at £22.95 (or any other set in the offer). Postage is £3.95.